03.25.10 The 40th Annual Maine State Scholastic Individual Chess Championships were played at the University of Maine in Orono on March 20, 2010. The tournament's highest-rated player, Matthew Fishbein, a sixth-grader from Cape Elizabeth, won the K-12 section with a perfect score. Joshua Shuman took first in the K-12 U1200 section. Wesley Parker, Haley DeLuca Lowell and Colin Smith tied for first in the K-8 section. Bethany Humphrey won the K-6 section and Ritvik Kumaran took first in the K-3 section. The Maine State Scholastic Individual Chess Championships are the final leg of Maine's spring scholastic chess trilogy which includes the Girls Championships and the Team Championships. New state scholastic champions were named in four sections: K-3, K-6, K-8 and K-12. Other than the Maine State Closed Championship tournament, which started in 1959, the state scholastic championships are the oldest continuously running tournament in Maine--the first being held in 1971. This tournament brought together top scholastic chess players from across the state to compete for state individual championship titles. 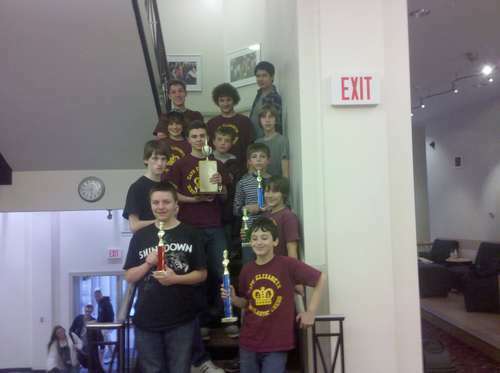 With three state scholastic individual championship titles under his belt (K-3, K-6 and K-8), Matthew Fishbein set his sights on capturing the Holy Grail of Maine scholastic chess--the individual K-12 championship. Mission accomplished. On March 20, 2010, Matthew, a sixth grader from Cape Elizabeth, became the youngest player (at age twelve) to achieve this title. Previously, the record was held by Aaron Lewis of Falmouth who, in 1993, won the first of six consecutive high school individual championships as a seventh grader. With wins over Gianluca Pane, Jiawei Zou, Andrew Audibert and Aaron Spencer, Fishbein posted a perfect score of 4.0 points and increased his USCF rating to 1805. He is the highest rated scholastic player in the state. Trailing Fishbein with 3.0 points were Aaron Spencer (John Bapst High School), Andrew Audibert (Bangor High School), Margaret Bryan (John Bapst High School), Keji Xu (Bangor High School) and * (Cape Elizabeth High School). Based on tiebreaks, the third place trophy was awarded to Audibert. Spencer received the second place trophy and an invitation to the National Denker Tournament of High School Champions played later this year at the U.S. Open as Fishbein is not of high school age. In the K-12 Under USCF 1200 section, Joshua Shuman of Dexter Regional High School scored a perfect 4.0 points and received the first place trophy. Vincent DeMarco of Cheverus High School scored 3.0 points and received the second place trophy. Five players were tied for third, each scoring 2.0 points: Ben Touchette (Westbrook High School), Josh Audibert (Bangor High School), Yuval Boss (Orono High School), Derek Hoyt (Wilton High School) and Deanna Power (John Bapst High School). Touchette received the third place trophy on tiebreaks. In the K-8 section, three players tied for first to share the title of K-8 State Champion: Wesley Parker (Cape Elizabeth Middle School), Haley DeLuca Lowell (Airline Community School) and Colin Smith (Cape Elizabeth Middle School). In his first round game with Helen Zhang of Orono, Parker, by far the highest rated player in the section, allowed a stalemate which opened the door for the rest of the field to have a shot at first. DeLuca Lowell and Smith each won their first three games and as a result were paired together in the last round. They played to a draw to finish with an undefeated 3.5 points and a share of the title. Parker, the only other player within striking distance, won his last round game with Anna Bryan and also finished with the undefeated score of 3.5 points. Trophies awarded based on tiebreaks were Colin Smith (first), Haley DeLuca Lowell (second) and Wesley Parker (third). In the K-6 section, Bethany Humphrey, a sixth-grader from Deer Isle-Stonington Elementary, went 4-0 to capture the elementary state championship title. Her last round game with Laddy DeLuca Lowell of the Airline Community School was historic. As far as we know, it was the only time two girls played head-to-head in a final round to decide a Maine state scholastic championship title. DeLuca Lowell was one of four players who tied for second place with 3.0 points, the others were Ian Youth (Breakwater School), Jasper Hansel (Cape Elizabeth) and Claudia Serban (Bath). Zachary Grindal (Airline Community School), Brendan Penfold (Deer Isle-Stonington), Soozin Cha (Deer Isle Stonington), Max DeLuca Lowell (Airline Community School), Zack Caron and Orly Vaughn (Deer Isle-Stonington) tied for sixth place with 2.0 points. Aiden Coyne scored 1.5 points, she was followed by Kinsey Bartlett, George Payne and Isaac Vaughn scoring 1.0 point. The crosstable was rounded out by Miles Martin. Ritvik Kumaran of Veazie scored 4.0 points in four games to become the K-3 State Champion. Samuel Rallis and Eric Youth, both students at the Breakwater School in Portland, tied for second with 3.0 points. Michael Hayden and Kyle Russell each scored 2.0 points to tie for fourth place. Eli Spahn finished with 1.0 point and Charlie Leng and Vetri Vel each scored half a point. In addition to the scholastic events, the Sixth Annual Sidekick Quads were played in two sections. In Quad 1, Yuri Riabkov, Ryan Tripp and Daniel Robbins tied for first posting 3.0 points with John Ellison going scoreless. In Quad 2, Daniel Fishbein (dad of K-12 section champion Matthew Fishbein), won with 3.0 points. He was followed by Ed Rudnicki (1.5 points), Mark Parker (1.0 point) and J. Paul Ciarrocchi (0.5 point). These events were directed by Lee Doucette (K-12), Phil Lowell (K-8), Dan DeLuca (K-6 and K-3) and Andy Bryan (Sidekick Quads) and organized by Ron Lewis and Kathy Richards. Bob Solinger coordinated the trophies.Thanks to The University of Maine for hosting this event and thanks to the many volunteers, parents and players for making the 40th Annual Maine State Scholastic Individual Chess Championships a great success! As a special feature of this report we bring you a game from each of the championship sections. K-12 Champion Matthew Fishbein considers his position during his second round game. This was the game that decided the K-12 championship. Aaron Spencer (left) makes a move vs Matthew Fishbein. As the game progressed Fishbein developed a winning advantage. After the game the two players chat about the possibilities as K-6 player Max DeLuca Lowell looks on. Joshua Shuman scored a perfect 4.0 points to take first place in the K-12 U1200 section. Vincent DeMarco took clear second with 3.0 points. K-12 Under 1200 section winner Joshua Shuman (right) plays Josh Audibert in the final round. Shakespeare and chess have much in common: comedy, tragedy and profound experiences in the human condition. Between rounds coaches and players examined their games looking for insights. Here Westbrook High School chess coach Steve Morgan offers a few pointers. George Spahn (left) plays Haley DeLuca Lowell in round three of the K-8 Championship section. Tournament Director for the K-8 section Phil Lowell checks the pairing sheet. The deciding game in the K-6 section Laddy DeLuca Lowell (left) vs Bethany Humphrey was the first time in Maine scholastic chess history two girls played a championship game for a state individual title. Aiden Coyne scored 1.5 points in the K-6 section. Madison Martin gives his brother Matt a hand with some hydration betweens round in the K-6 section. Winners in the K-6 section (left to right): Claudia Serban (tied for second), Jasper Hansel (tied for second), Bethany Humphrey (first), Ian Youth (tied for second) and Laddy DeLuca Lowell (tied for second). Winners in the K-3 section (left to right): Sam Rallis (tied for second), Ritvik Kumaran (first) and Eric Youth (tied for second). Front to back, left to right: Row 1: Vincent DeMarco (2nd in the K-12 U1200), Matthew Fishbein (1st in the K-12 Championship); Row 2: Colin Smith (co-champion in the K-8 Championship), Wesley Parker (co-champion in the K-8 Championship); Row 3: Danny Brett, Jasper Hansel (tied for 2nd in the K-6 Championship); Row 4: Matthew Reale-Hatem, Nicholas Shedd, Ben Hansel; Row 5: Ethan DiNinno (tied for 2nd in the K-12 Championship), Brett Parker, Robert Anthony Freccero. Not shown: Kyle Russell, Ian Youth (tied for 2nd in K-6 Championship), Eric Youth and Samuel Russell (tied for 2nd in K-3 Championship), Alec and Charlie Leng. The tournament was held on the first day of spring and these flowers seemed to know it was the vernal equinox. Dan Fishbein won Sidekick Quad 2 with 3.0 points. President of the Maine Asociation of Chess Coaches Ron Lewis (standing) shares a laugh with Maine Chess Association President Andy Bryan. See you next year! Congratulations to Matthew in what is sure to be a long line of championships. Also congratulations to Aaron for continuing the great tradition of second place finishers attending Denker.